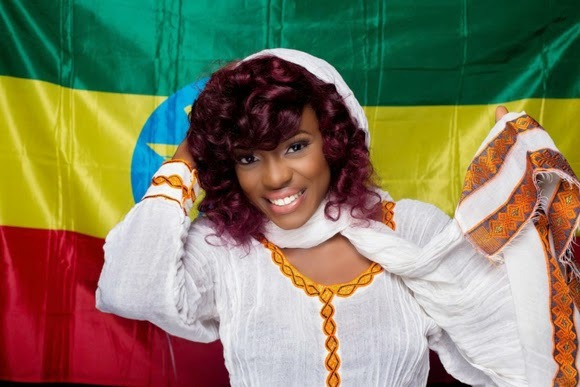 Today (Sept. 27) is former Big Brother Africa housemate Beverly Osu‘s birthday! And to celebrate turning 22, the reality star who has been through some controversial stuff is showing off her new curly & purple look in a new Ethiopian/South African inspired photo shoot! 22 represents God,The Master Builder, The Manifestation of Dreams, The Future, realization, personal power, retribution, love, war, and a visionary. As I turn 22 I am proficient and a strong leader, I have the potential to be successful, I will fulfill my highest potential by bringing ideals into everyday reality. I am stronger today because I turn 22. I represent an African leader, The strength of a woman. “I am a woman. I do not like war. However, I would rather die rather than accepting your deal…”These were the words of Empress Titus, The ETHIOPIAN QUEEN, wife of Emperor Menelik, she is known to have wielded considerable political power, she was a key player in the dispute over the “Treaty of Wuchale” with Italy in which the Italian version made Ethiopia an Italian protectorate.“Wathin’t a bafazi, way ithint’imbolodo ufo Kufa” (now you have touched the women (strydom), you have struck a rock, you have dislodged a boulder, you will be crushed). I have found my strength after the BBA show…I’ve been down but not crushed, I am humble but not stupid, I fall, I rise, I make mistakes, I learn, I’ve been hurt but I’m alive. I’m human. I am 22 years old, I’m youthful, I’m a moving train, I’m BLACK DIAMOND, I’m a young African woman with the grace of God leading me.I am a working progress.